It’s peach season, and although I’ve been warned that the peaches in Florida took a dive this year due to weird weather, they are coming in fast and thick in Blacksburg, VA, where I live. They are good. I like the small ones that come from a local orchard and are the stuff of childhood memories; fist size orbits with a soft equatorial fold of golden yellow and reddish fuzz that exhale a delicate sweetness. They coat your tongue with a softness that calls to mind cream….and probably explains that connection. So in order to keep these hot summer days stored away for future reference, I like to make peach jam, but I want a jam that can accompany a cheese/charcuterie board that is a favorite wintertime meal without being cloyingly sweet, so I put jalapenos in the mix. It raises the game to another level. It’s easy to make up small batches of jam which will keep in your fridge for a week or two, and they make for a special kind of breakfast, when your days are full, and particularly when the weather is grim. 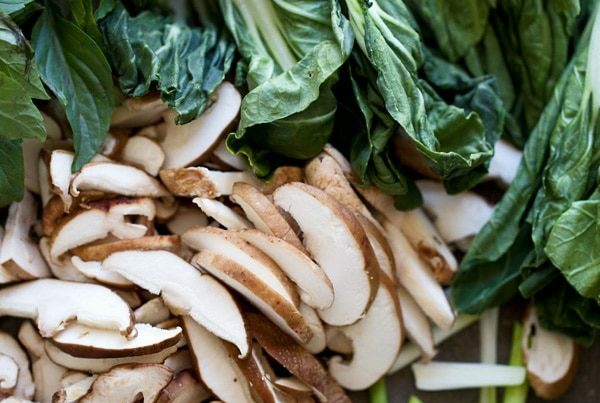 My go-to foundational recipe is an old Mark Bittman recipe from the New York Times which you can find on the VABF website. ( need a link here) It gives me a good idea of the proper proportions of sugar-to-fruit which I like. It’s so general too, that I can tackle the unexpected arrival of hard to find fruit like wineberries without insecurity. Sugar seems to be the biggest swing factor I’ve found in jam recipes, so really the best advice is to taste, taste, taste, before you pour those 5 cups of sugar into the mix and realize that you’ve gone too far. The goal, of course, is to let the flavor of the fruit dominate, and not the level of sweetness. Rarely do I follow recipes religiously. I think of them as guidelines and what transpires is a combination of what I’ve got in the frig, what my ingredients are telling me, and my fussiness level. Along the way, I’ve learned that if you substitute brown sugar for white, the color of the jam degrades away from the pure loveliness of peach, and that if you mince the jalalpeno peppers in a food processor, and then pulse them with some additional peaches to the mix, the peppers dissolve into a green sheen which ruins that little-flecks-of-green effect that make the jam more visually interesting. Also note that the heat from the jalapenos dissipates after you open a jar. That’s too bad in my mind, but it also tells you that you needn’t worry if you added too many seeds. Patience will win out in the end. I don’t know why that happens. 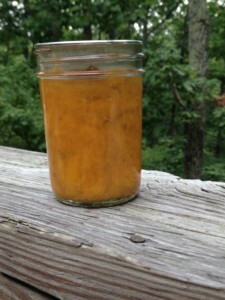 I’m going to share a Jalapeno Peach Jam recipe and talk about canning in the process, since the whole point is to store that summer memory. Canning is not a big deal, but it is heat producing, so think about the time of day you want to tackle the job, if this is your path. Luckily, canning instructions have changed, so that you don’t need to sterilize the jars anymore if your water-bath processing time is over 10 minutes. No sterilizing, or boiling, or for that matter heating, the canning lids or their cousins, the screw-band rings. 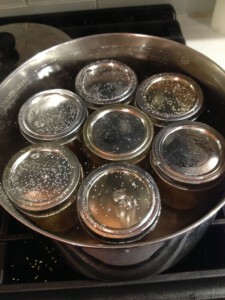 You do still want to heat the jars before placing them in the water bath, just so the jars don’t crack. 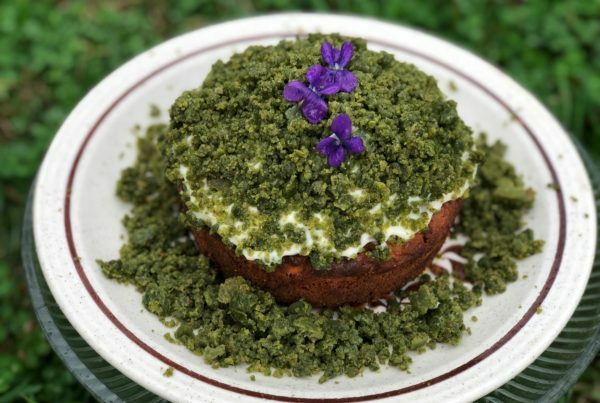 If you do decide to try this recipe, I’m thinking it might be fun to sample your efforts at the Annual Conference of Biological Farming at the Homestead in January. Think about bringing some for the Silent Auction! 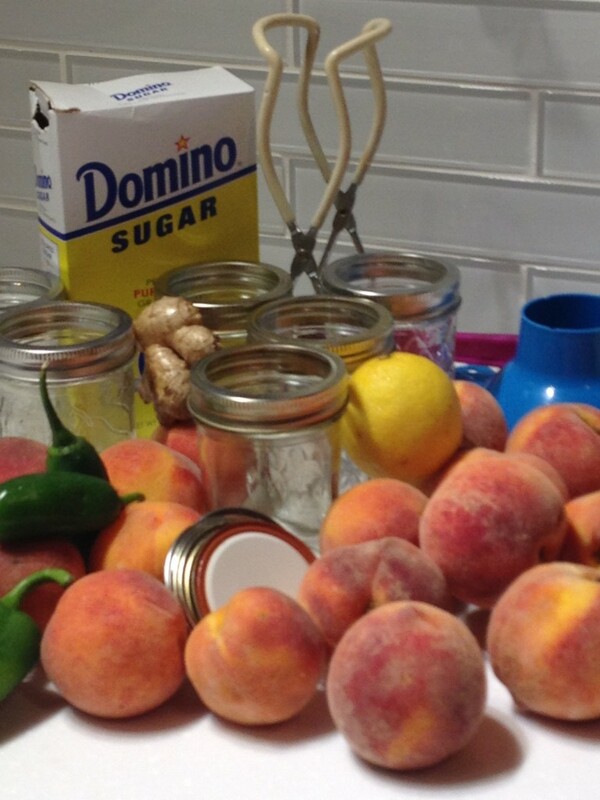 The process has three parts: Get the jars ready, prepare the jam, then sterilize the beautiful canning jars. 1.Gather your jars and lids and rings and wash them. Put a large kettle on to boil large enough to hold your jars for the water bath, and deep enough to cover them, sitting upright, with an inch of water. 2. In the meanwhile, peel the peaches by blanching them in boiling water for 30 seconds, and then transferring them to a bowl of cold water. This will help the skins slide off easily using just your hands. ( I do about three at a time, peeling the blanched three as the next three get thrown in the boiling water.) Once peeled, remove the pits and roughly chop the peaches. 3. Prepare the peaches. 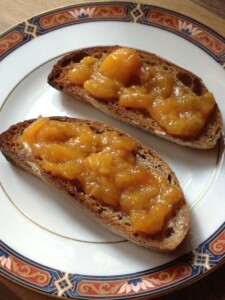 Throw the cut up peaches into a big pot, add the sugar, 2 TBSP lemon juice, cider vinegar, lemon zest, and ginger. Stir to combine and let sit 10-15 minutes to macerate. 4.Prep the jalapenos. Remove the stems and cut the peppers in half lengthwise. I’d include all the seeds, but that’s really up to you. 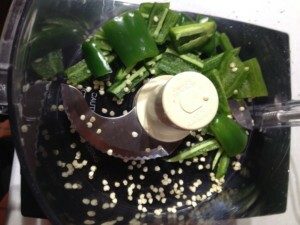 Add the peppers and seeds to a food processor and pulse, scraping down the sides until you get a fine mince. 5. 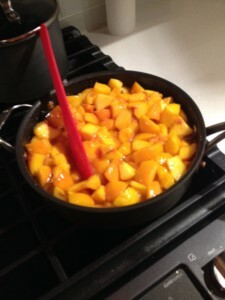 Add the peppers to the pot with the peaches and place over high heat. You can get a smoother jam by using an immersion blender at this point, or simply use a potato masher for a coarser look. This is where other recipes call for pectin, but I prefer to evaporate the extra juice away until I get a nice, little-bit-runny jam. This could take up to 30 minutes, so I use a largish frying pan to increase the surface area for evaporation. I do stir it frequently so that I don’t burn the batch. 6. Once you are happy with the seasonings and the consistency add the last TBSP of lemon juice. Taste it to adjust the seasonings here. More ginger? More apple cider? Maybe some balsamic vinegar? 7. Carefully ladle the jam into your clean jars, leaving 1/2 inch head room for each jar. A canning funnel is a big help if you have one. Once the jars are filled, wipe the rims with a damp towel to ensure a clean seal and screw on the lids. 8. Remember that pot you left to boil in Step 1? Lower your canning jars carefully into the hot water. (Canning tongs make this easy.) Make sure the jars are covered by at least an inch of water. Cover the pot with a lid and bring the water to a boil once again, letting the jars process for 10 minutes. 9. Remove the jars to a cooling rack, and wait for those satisfying “pop” sounds. After the jars have cooled, you’ll want to test each seal by pressing on the center of each lid. If the lid stays depressed, the seal is good. If it pops back up, the seal didn’t take, and you’ll want to put this jar in the frig for immediate use. You could also try another lid and do the water bath thing again. I’d keep my sealed jars for about a year. Put 1 pound of fruit (pitted and chopped if necessary) in a medium saucepan over medium heat. After a minute or so, add ¼ cup sugar (or to taste), seasonings to taste, and 2 tablespoons juice, vinegar, or whatever liquid you prefer. Adjust the heat so the mixture bubbles steadily, using higher heat if the mixture looks too soupy; lower the heat if it seems dry. Cook, stirring occasionally until the mixture is thick – 10 to 30 minutes. Cool completely and refrigerate; it will thicken more as it cools. Store in the refrigerator, where it will keep for at least a week. 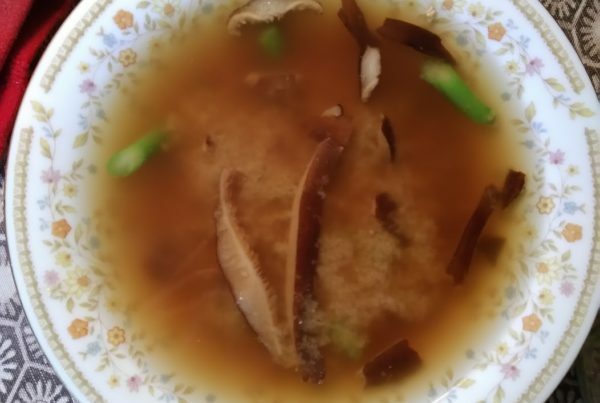 If necessary, remove any seasonings (like lemon-grass stalks) before serving. Any canning or food preservation advice given has not been evaluated by the FDA or USDA. You are encouraged to verify all canning and food preservation advice on the USDA food preservation or National Center for Home Food Preservation (http://nchfp.uga.edu/) websites. Therefore you are responsible for the results of your efforts. You are responsible to know current canning and processing recommendations.